A beautiful woman releases a Carpathian prisoner from his bonds—and unleashes his appetite—in a tale of unexpected desire from “the queen of paranormal romance”(USA Today)…He is Riordan…Carpathian male. Immortal. Seer. Now trapped and caged, his honor is compromised by his captors. They’re in his mind. They’re in his blood. And not one can withstand his desire for revenge.She is Juliette…A beautiful activist devoted to the liberation of animals from the foul and humid confines of secret jungle lab. What she has stumbled upon is an unexpected prisoner like no other she has ever seen. Or touched.She will release him from his bonds. He will release her from her inhibitions. Both have a voracious appetite that needs to be sated. And tonight their dark hunger will be fed…Previously published in Hot Blooded. 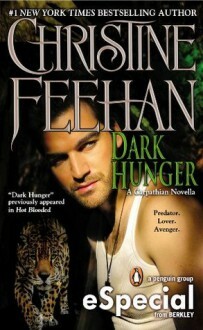 Includes a preview chapter from Christine Feehan’s Dark Storm, out September 2012. I’m a fan of the Dark Series’ books. This comic book format is completely lacking in many areas, its awkward, characters have no depth (like in the books), and no real plot. The characters deserved better.